Draw to Perform is an international community of artists collaborating to display drawing performances in workshops and residencies around Brighton & Hove. We spoke to the curator and director, Ram Samocha, about his experiences of using the studio space and how the history of Copperdollar Studios was reflected in some of the performances. Hi Ram. Can you please start off by explaining what Draw to Perform does to someone who hasn’t come across your performance art? Draw to Perform is a stage for drawing performance practice. It’s basically a company that provides opportunities to share and discuss process, about life, art, and especially about actions that relate to drawing and mark-making live. I started it in 2013, and we have started with a symposium and then over the years, we made drawing performance festivals, workshops, collaborations with institutions, and recently the Draw to Perform residency in Copperdollar Studios. How did you first hear about Copperdollar Studios? I think it’s not by accident that I connected to Copperdollar Studios and especially to Kt, which coming from also from a variety of practices that she combines. I was browsing the internet and I accidentally came across a poster one of my friends posted about an event happening in Copperdollar Studios. I immediately liked the atmosphere and the specific design. The space was very appealing to me. I always try to find different places and different solutions rather than the white cube [studio] option. Immediately, I started to search for this and when I met Kt later on to view the space, she was so nice and open, and I said ‘this is great, we can do something here’. How did you find your experience using the studios for your residency last year? It worked really beautifully, it was a space for activity. That’s the whole point of performative drawing, sharing the process and the influence. Quite a few times, people collaborate in the studio. One of the artists built two performances, one downstairs and one upstairs, all relating and connecting with the space itself. It was a site-specific performance. 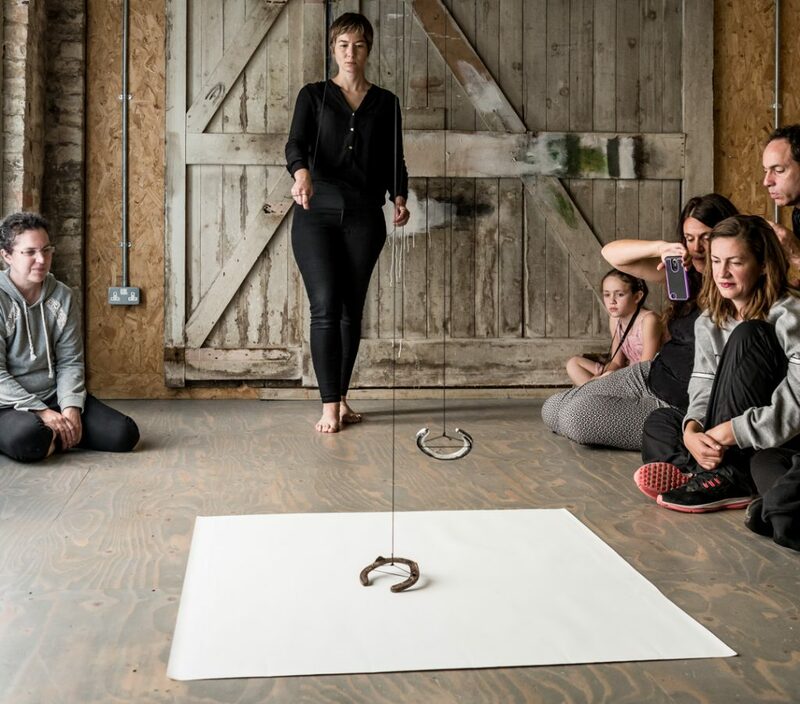 For the first performance, artist, M.Lohrum used horseshoes in which tapping them on the floor created marks. It was recalling the sound that would have been heard in that studio [The Stable] before. Upstairs, for her second performance, she hung parchment paper from the rafters and using a horsewhip as a drawing tool. Doing those whip gestures, creating sounds, and turning the paper into an interesting final image. It’s a different way of thinking about mark, action, and drawing. What is your favourite aspect about Copperdollar Studios and what makes it different from other creative spaces you’ve used previously? The uniqueness was in the history of the space. The fact that Kt preserved and manipulated the traces of history within the space, but didn’t destroy it, and creatively operated within it. Also being close to the sea was very interesting because a lot of the artists were really inspired by the location, the closeness and the feeling of the sea. Artists from China came to Brighton and said ‘In China, you can strongly smell the sea. Here you can’t’. That’s why we have residencies in a way, to have someone else reflecting on the place you’re living and familiar with already. What inspired you to set up the community to curate and exhibit drawing performances? Originally I was searching for direct communication with my audience. Not just hanging pictures and let the viewer view, but to gain more inter conversation, with me as an artist with the ones who come and want to interact and understand the process and the work of art. It was very important to me to have a conversation and that’s how I started with live performances. Then I did my Master’s in Canada all about drawing and performance and eventually I understood that there is this need to be a community. People constantly ask me ‘what is drawing performance?’ They knew about performance art but then [live drawing] was really strange for them. 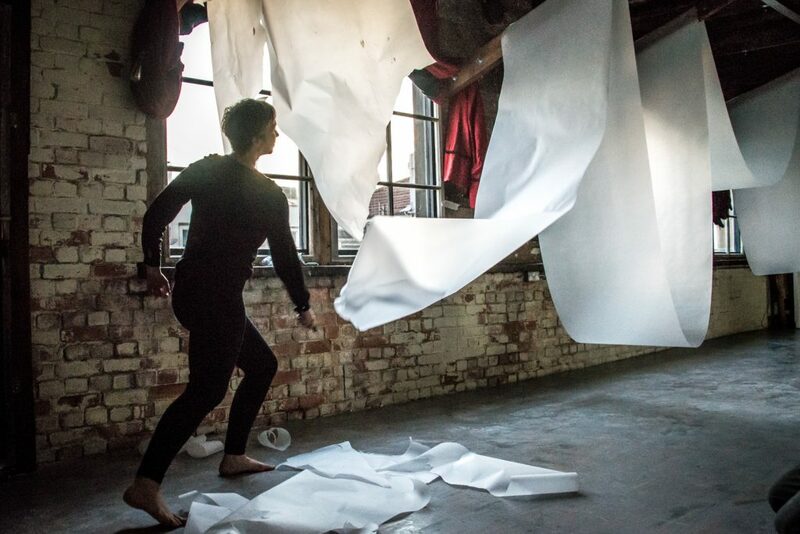 What makes drawing performances different from other artistic disciplines? For the Draw to Perform residency, artists come to take part in it from all different disciplines. It’s not just about doing a live drawing performance. It’s about brainstorming how to make, how to produce, to make marks, how to mutilate your gestures, how to collaborate with other people and with the audience. And eventually, how to show it in the live performance drawing event at the end of it. Can you tell me about your open call for residency coming up later this year at Copperdollar Studios? The next residency going to be in Copperdollar Studios will start on 27 April and will end on 11 May. It’s a two-week residency. The open call is on the Draw to Perform website and it will be open until 10 February. We already have artists coming from China, Australia and Wales. I want to thank Copperdollar Studios for making it so appealing and perfect. We’re looking forward to the next residencies and events that will be happening in the wonderful creative space. Find about more about Draw to Perform by visiting their website, or following them on Facebook or Instagram. Thanks so much to Ram for discussing his memories of Copperdollar Studios and the Draw to Perform residency that’s coming up later this year. For those looking to find out more about the Copperdollar Studios, get in touch today. We’d love to show you around. Email info@copperdollarstudios.co.uk!